A police K-9 helped officers in Prince George's County locate a missing District Heights woman Friday morning. According to police, a woman called 911 at 2:30 a.m. Friday to report that her 62-year-old grandmother, who suffers from dementia, had wandered away from their District Heights home sometime after midnight. 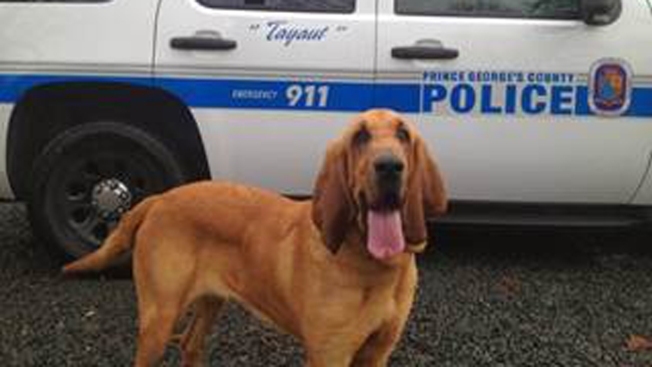 Officers responded to the scene and began their search, bringing a K-9 named Tayaut along to help. Tayaut sniffed the woman's pillowcase and followed her scent pass two rows of townhomes, a playground and into a wooded area. Police say Tayaut found the woman about 70 yards into the woods, tangled in some thorn bushes. Unable to free herself, an officer carried her out of the woods at 4:20 a.m.
She was taken to an area hospital. Police did not release her condition.